[November, 2003] Together with friends I emptied a bottle that I bought for 49 Euro in August, 2003. In my old rating system (ten scales that translate into WB points: 50 - 66 - 75 - 80 - 82,5 - 85 - 87,5 - 90 - 92,5 - 95) I scored it 87,5. I took no further notes. 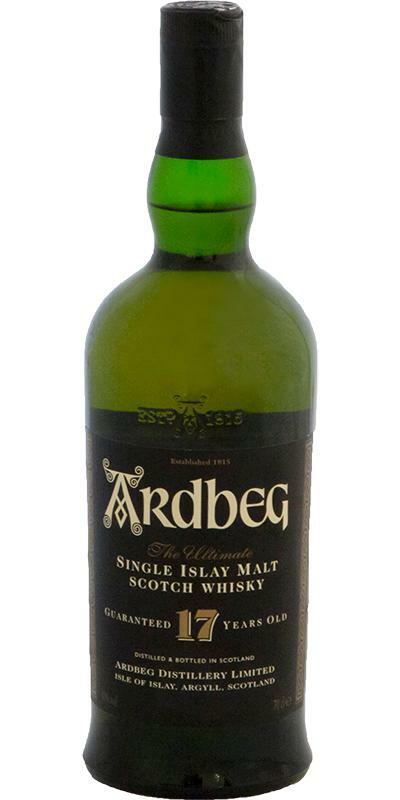 Task: Make me an Ardbeg who has no more smoke and does not taste like Ardbeg. Basically, everything has been bred out here, which usually makes an Ardbeg. And that's not just because he was bottled with Ardbeg's rather unusual understatement 40% Vol. Smoke is present, but only as a short visitor in the nose. Otherwise, this is a whisky, which seems to want to compete with a slightly matured Glenmorangie. Not a bad whisky, not that. And why not play around with the possibilities of barrel selection and everything else? But you should not expect a "real" Ardbeg here. Sweet melon, applesauce, pear and orange juice - it starts fruity, the fruit note is not intrusive, but scurries discreetly into the nose. At the beginning a minimal trace of smoke, some tar and salt - but this impression vanishes quickly. Instead, fruity notes predominate, accompanied by vanilla and honey. Slip gently over and over the tongue and lay there for the beginning green apples and over-ripe pears. Fine-sour wood flavors give a certain depth. On the tongue one searches the smoke in vain. All gone. After a while, the fruits mingle with milk chocolate, and vanilla and honey also set in after a while, making sure that the tart wood aromas do not turn bitter. Short to medium with local fruits, dry wood and honey. I think I remember that Jim Murray some time ago, chosen this particular bottling as the best Ardbeg, he had tasted in a long time ! Sweet, dusty and floral with notes of pineapple, apricots, mango, papaya, heather, lavender, malt, pine resin, a hint of petrol, sea air, bonfire smoke and peat. Big and rich with notes of apricot, citrus, vanilla, cocoa, pepper, chili, sawdust, salt, sweet oak and lots of peat. Slightly bitter. Fairly long with notes of red grapfrugter, vanilla, hint of cardamom, malt, tar, charred wood, peat and oak.